Starter and Deep Cycle Batteries – Flooded, AGM and Gel versions… What’s the difference? Basically there are two types of lead acid batteries: Starting (used for starting, lights, and accessories) and Deep Cycle (used in golf cart applications). The lead comes from the lead grid and lead oxide used for the battery plates. The acid comes from the electrolyte liquid mix of water and sulfuric acid. The Starting battery is designed to deliver the quick, short bursts of high energy needed to start engines. To provide for this energy burst, the battery has a series of lead grids onto which a lead oxide paste is attached. These grid plates are placed in a battery case and flooded with the electrolyte. A Starting battery has a greater number of thinner plates than a Deep Cycle battery but they should not be used for deep cycle applications because the thinner plates are more prone to warping and pitting when repeatedly deep discharged. Warping and pitting can/will cause the lead oxide paste to break off the grid damaging the battery. This damage is normally indicated by the bulging of the lower half of the battery. Deep cycle batteries have less instant energy than Starting batteries, but greater long-term energy delivery needed for traveling distance. Deep cycle batteries have the same lead oxide paste as Starting batteries but use thicker and longer lead grid plates which can survive a greater number of discharge cycles. Brands vary on the grid design and density of the paste. Wet Cell (flooded), Gel Cell, and Absorbed Glass Mat (AGM) are various versions of the lead acid battery. 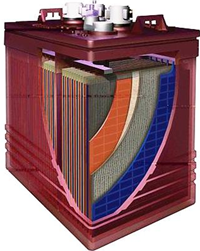 The Wet Cell (flooded) is the most popular Deep Cycle battery because of cost:performance. However, the electrolyte (water and sulfuric acid) in the battery needs to be maintained to provide for long term performance and battery life. Generally, Gel and AGM batteries have about 20% less capacity than Wet Cell, cost about two times more, and have a shorter cycle life than comparable flooded lead acid batteries. However, Gel and AGM batteries do not need watering, are safer (no acid spilling out), can be placed in a variety of positions, have a slower self-discharge characteristic, and are more efficient in charging and discharging than flooded batteries. Gel batteries are more suitable for deep cycling applications whereas AGM batteries are more for light cycling and engine-starting applications.